Content by Pam Huber. Originally published on September 1, 2000 @ Campus Report. For the film industry, the 1970s were a time of transition. Summer blockbusters were in the their infancy with Jaws as the prototype. Films with less than guaranteed global appeal were still being greenlighted by major studios and fleshed-out scripts carried more weight than one-phrase story concepts. It was a time of personal films. For author Tony Macklin the 1970s were also a time of interviews, conducted with the Hollywood elite for the academic journal he founded and edited from 1965 to 1978, Film Heritage. 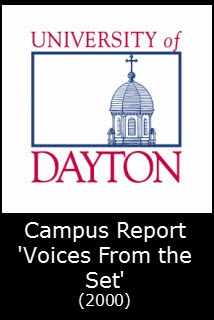 Macklin, who was the film critic from 1969 to 1977 for the now-defunct Dayton Journal Herald, retired in August after 38 years of teaching film and English classes at the University of Dayton. He's collected the interviews, many containing previously unpublished material, for Voices from the Set: The Film Heritage Interviews, a book due out this month from Scarecrow Press Inc. ($39.50, 352 pp). Co-editor of the book is Nick Pici, who earned his bachelor's and Master's degrees from UD. The book is a gathering of icons -- Alfred Hitchcock, Howard Hawks, John Wayne, Edith Head -- as well as the new breed -- Robert Altman, Sam Peckinpah, Warren Beatty -- and even up-and-comers of the time -- Stockard Channing and composer Richard Baskin. "For me the interviews are like precious cameos that gain more value as time passes," Macklin writes in his introduction. "I hope their faces gleam for others." Time has proven the worth of the decade, Macklin said. "I always knew that to me it was an important time, that the films had quality. But I didn't know it would become a golden age of film." He calls the book a fan's book, "because I'm not sure how many students of film there are today. Many students of film today have no context. You almost have to resurrect the 1970s because they haven't seen the films. "It's the video game generation. I had believed they would be a great film generations, but instead they love the sophomoric wit of filmmakers like the Farrelly brothers and Kevin Smith with his Clerks and Dogma. Nashville is forgotten. "I want to keep the past alive." His favorite interview in the book is the one with John Wayne. "He wrote me a letter that said 'You caught me in print as no one else has. Thanks. Duke.' I like the Hitchcock interview, too, and his press agent, who sat in on it, told me Hitch said some things he'd never said before in an interview. But if it were possible to interview him today, it would be a much better interview. It would have been deeper. And book length."